The new Hellboy can’t stand up to Shazam in its opening weekend at the box office. 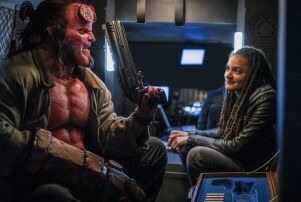 Hellboy will open in third place, earning $12 million from 3,303 locations in its first weekend. Shazam remains in first place with another $25 million for the weekend, bringing its domestic box office total to almost $95 million. The film is directed by David F. Sandberg and written by Henry Gayden. It’s based on the DC character Shazam, first known as Captain Marvel, who was created by CC Beck and Billy Parker for Fawcett Comics in 1940. Asher Angel plays Bill Batson and Zachary Levi plays Billy’s superhero alter ego, Shazam. In this superhero-comedy film, Shazam takes on the villain Dr. Sivana, played by Mark Strong. The film also stars Jack Dylan Graer as Billy’s friend Freddy Freeman and Djimon Hounsou as the wizard who grants Billy his powers. Pet Sematary moves into fourth place in its second weekend. It is the second film adaptation of Stephen King’s 1983 horror novel. The 2019 update is earning $10 million this weekend, bringing its total to $40.1 million. The film is directed by Kevin Kölsch and Dennis Widmyer from a script written by Jeff Buhler. Tim Burton’s live-action adaptation of Disney’s Dumbo moves into fifth place, earning another $9.2 million, bringing its box office total to $89 million. Captain Marvel moves into sixth place, earning another $8.6 million in its sixth weekend. That brings its domestic box office total to $386 million. The film has grossed more than $1 billion worldwide. Jordan Peele’s Us moves into seventh place in its fourth weekend. The horror film will earn another $6.95 million, bringing its total to $163.5 million. Accompanied by her husband, son anddaughter, Adelaide Wilson returns to the beachfront home where she grew up as a child. Haunted by a traumatic experience from the past, Adelaide grows increasingly concerned that something bad is going to happen. Her worst fears soon become a reality when four masked strangers descend upon the house, forcing the Wilsons into a fight for survival. When the masks come off, the family is horrified to learn that each attacker takes the appearance of one of them. Laika’s latest stop-motion animation feature,Missing Link, opens in ninth place. The film earned $1.7 million on Friday leading into a $5.84 million opening weekend.